"After 16 years, Jones concludes her Dalemark Quartet....Fifteen-year-old Mitt finds the North nearly as dangerous as the South, which he fled after being charged with murder. Now his benefactress wants him to assassinate Noreth, a young woman determined to claim the crown of Dalemark and reunite the country; but instead, Mitt befriends Noreth and joins her supporters....Treachery, mystery, humor, and magic abound in this intriguing, well-crafted fantasy."--Booklist. Diana Wynne Jones (1934-2011) wrote more than forty books of fantasy for young readers. Characterized by magic, multiple universes, witches and wizards—and a charismatic nine-lived enchanter—her books were filled with unlimited imagination, dazzling plots, and an effervescent sense of humor that earned her legendary status in the world of fantasy. Copyright 1996 Reed Business Information, Inc.
6. 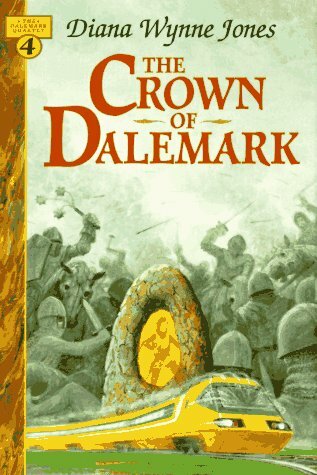 Crown of Dalemark, The (Dalemark Quartet, Book 4) Jones, Diana Wynne and Smith, Jos. A.